i love this time of the year, with the decorations, seasonal music, parties, + of course, holiday drinks! i’m working on some new martinis at the moment, but i wanted to start december off with a holiday-friendly drink. what else is more perfect (+ traditional) than eggnog? eggnog is traditionally made with raw eggs, as seen in the directions listed first. if that makes you nervous, use the cooked adaptation. i only made the raw version + absolutely loved it. i strayed slightly from the directions, in that i did not put in the bourbon straightaway. instead, i made a batch of non-alcoholic eggnog, then spiked glasses as needed. that way, you have options for both boozy friends + non-drinkers. this eggnog is wonderfully fresh, creamy, + surprisingly light-tasting + the bourbon gives it the perfect celebratory twist. i used bourbon (since that’s what the recipe called for), but others use brandy or rum sometimes instead. i’ve already had a friend try out this recipe (hi julie!) + she gave it rave reviews. i’d love to hear your thoughts – do you go for the raw version or do you prefer a cooked adaptation? also, what do you use to booze up your ‘nog? bourbon? rum? brandy? or something different? in the bowl of a stand mixer, beat the egg yolks until they lighten in color. gradually add the 1/3 cup sugar + continue to beat until it is completely dissolved. add the milk, cream, bourbon + nutmeg + stir to combine. place the egg whites in the bowl of a stand mixer and beat to soft peaks. with the mixer still running gradually add the 1 tablespoon of sugar + beat until stiff peaks form. whisk the egg whites into the mixture. chill + serve. note: for cooked eggnog, follow procedure below. in the bowl of a stand mixer, beat the egg yolks until they lighten in color. gradually add the 1/3 cup sugar + continue to beat until it is completely dissolved. set aside. in a medium saucepan, over high heat, combine the milk, heavy cream + nutmeg + bring just to a boil, stirring occasionally. remove from the heat + gradually temper the hot mixture into the egg/sugar mixture. return everything to the pot + cook until the mixture reaches 160 degrees. remove from the heat, stir in the bourbon, pour into a medium mixing bowl, + set in the refrigerator to chill. in a medium mixing bowl, beat the egg whites to soft peaks. with the mixer running gradually add the 1 tablespoon of sugar + beat until stiff peaks form. whisk the egg whites into the chilled mixture. *raw egg warning — Food Network Kitchens suggest caution in consuming raw and lightly cooked eggs due to the slight risk of salmonella or other food-borne illness. To reduce this risk, we recommend you use only fresh, properly refrigerated, clean grade A or AA eggs with intact shells, and avoid contact between the yolks or whites and the shell. 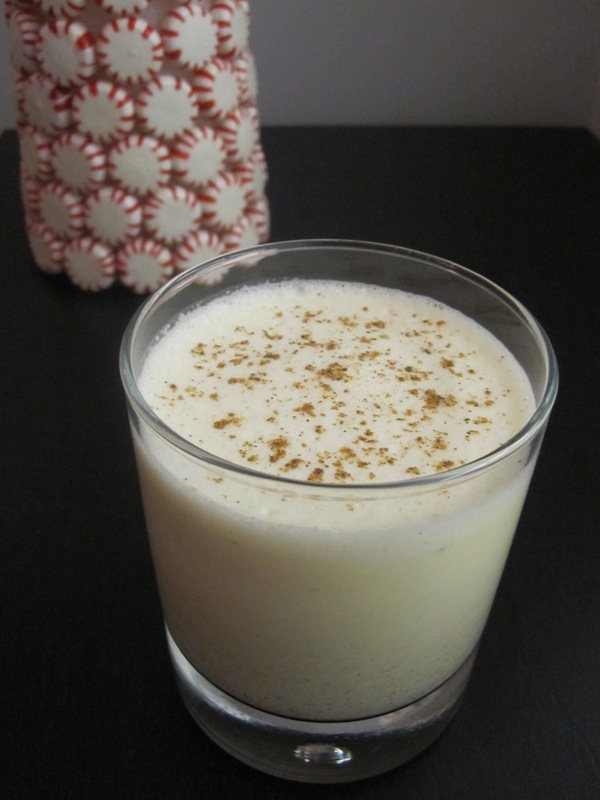 It certainly is the time of year for bourbon-spiked eggnog. Fortunately I have an uncle visiting from Louisville who can snag a fresh bottle of the good stuff. 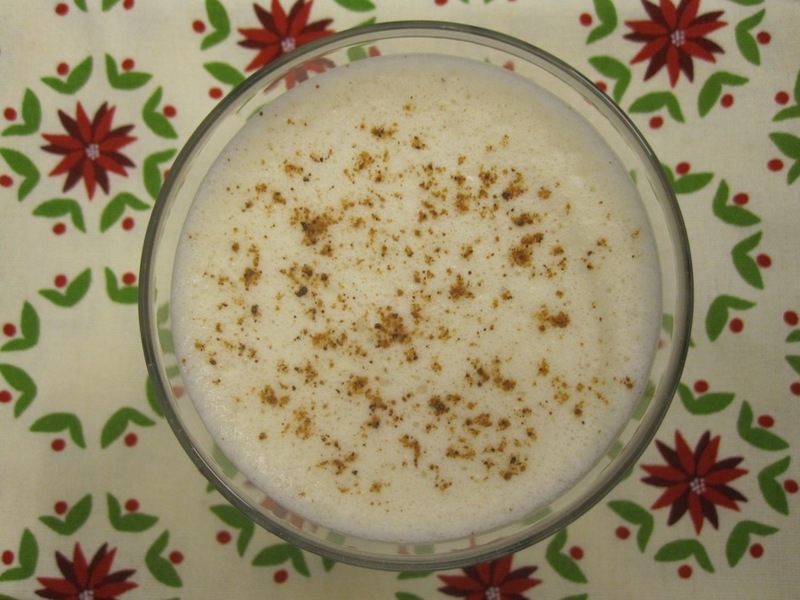 Maybe this will be the year I learn to love eggnog — this recipe looks promising! *definitely* have your uncle bring down some good kentucky bourbon – that’s where the four roses bourbon i used came from + it is delicious! i’m not a huge eggnog fan either – just a couple small glasses over the holiday season is enough for me. but it’s so traditional (+ easy to make) that i need to get a little bit in each year. cheers! even people who claimed to “absolutely hate” store-bought eggnog loved this creation. it’s easy, adaptable, and delightful. i used half-and-half for heavy cream, 2% for whole, and for the cooked version, a carton of pasteurized egg whites for raw. sadly, neither batch was boozed up (the traditional was made for my non-drinky mother, and the cooked for a holiday party with a nursing mama in attendance), but I plan to make half of a bourbon’d version this weekend, just for me! ha, you noticed the shout-out. =) i love that you made a lower-fat + lower-calorie version + that it still turned out great. i can’t wait to hear what you think of the bourboned version! caution: you may want to consume it on a night when you’re just hanging at home + watching movies — that stuff sneaks up on you fast. cheers!